You know those pieces you didn’t know you needed in your life until you set eyes on all of its beautifully crafted glory? Patrizia Pepe likes to make plenty of those - especially in her accessories collection. This was the case for me and this roomy tote. 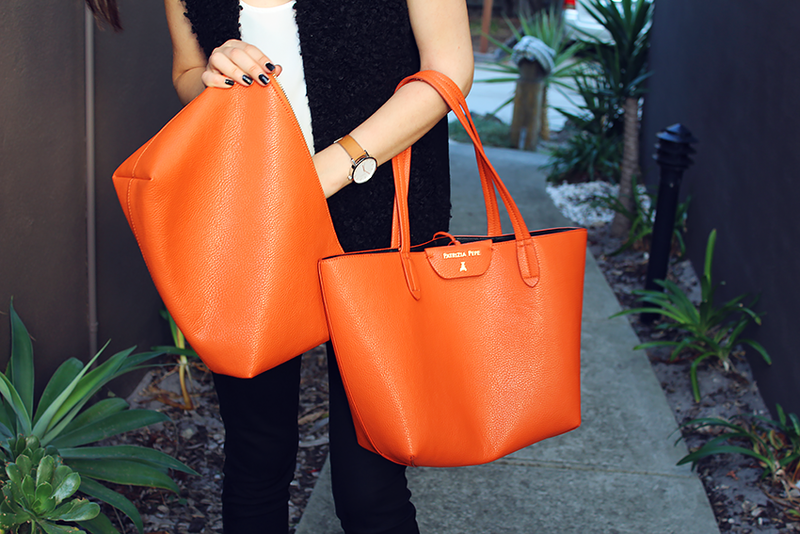 I couldn't resist the orange reversible to black Eco-leather, nor its (giant) additional bag. For someone who doesn't carry many things in their bag, I just like the option of being able to... I mean now if I wanted to carry my laptop, books, a second wardrobe, crystal collection, plus snacks around, I finally can. (I do acknowledge that a bag of this magnitude will take some serious organisational skills to keep everything identifiable, but I am more than up for the challenge). I also couldn't resist another shag item to add to my wardrobe, in the form of an all-black, contrast back vest by Marella (of the Max Mara group!). I'm now one step closer to that Winter layering dream I keep talking about.. I LOVE this outfit and that bag! I normally don't like orange too much but it looks gorgeous! http://trendkeeper.me .. Travel diaries and be featured! Love the colour pop! 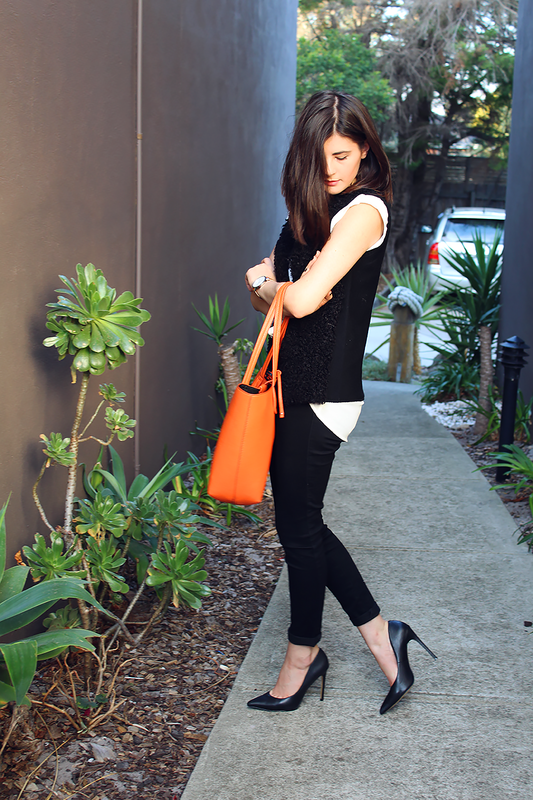 And your heels make this outfit so chic! 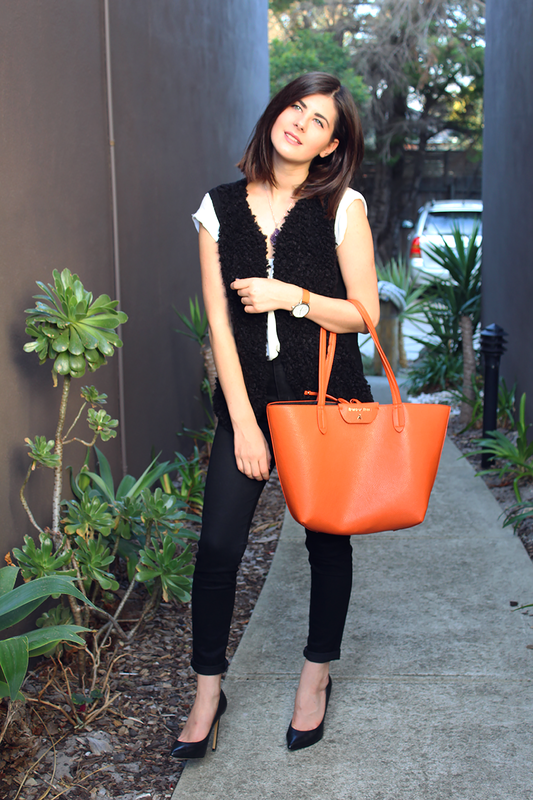 We are so loving this all black look, and adore your bag!! 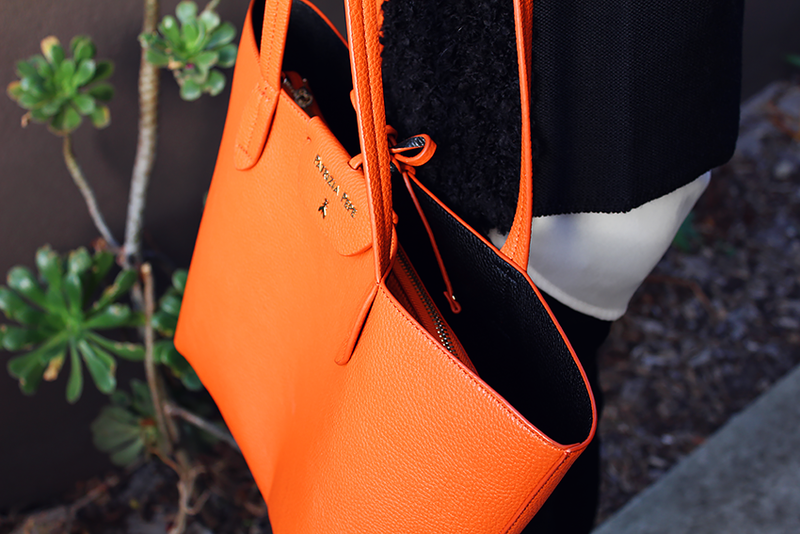 I love how that bright orange bag looks against the black and white! Such a fun colour and it certainly will fit a lot, great investment! :) Winter is just around the corner! We are starting to have some cooler days here in Brisbane at last - seems to have taken forever for the summer heat to dial down! You look absolutely stunning! I love your style and outfit! Love this beautiful outfit combo. The bag is stunning! Haha, yeah, it's nice to have the option! I've been meaning to get a roomier bag just in case I have a lot to carry around one day (though I normally don't). You never know! 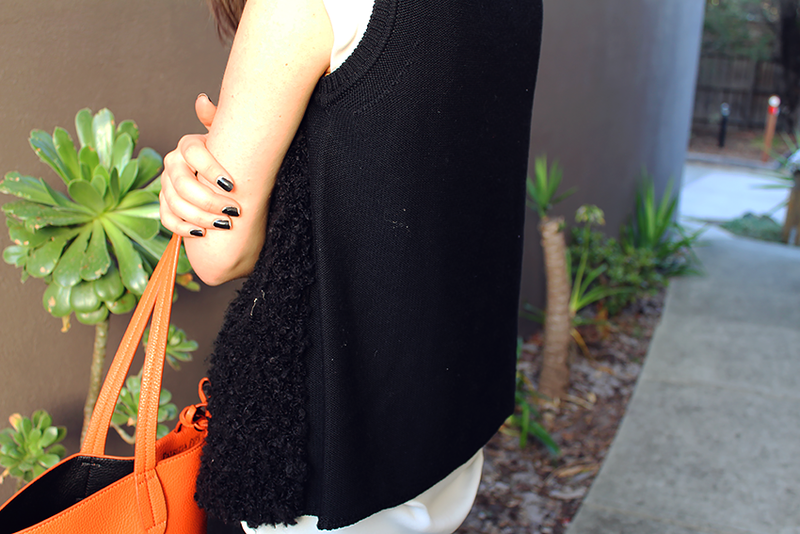 Love the shaggy black vest, it's gorgeous. Very chic! 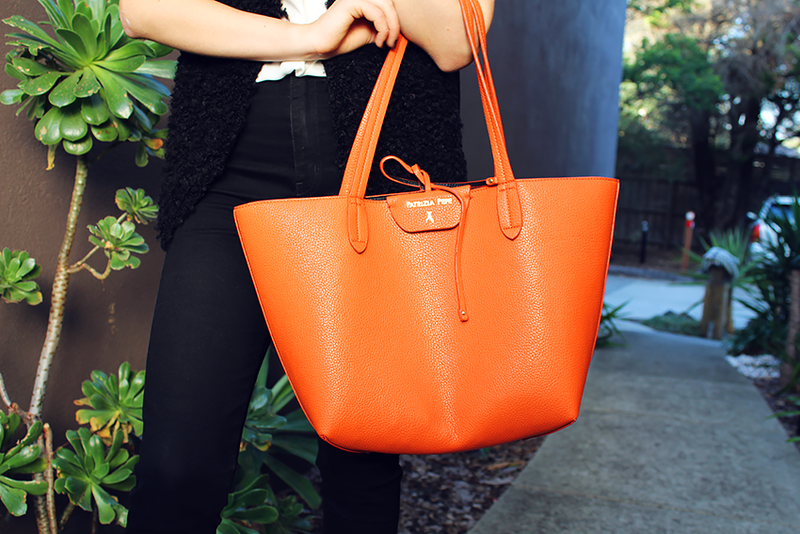 Oh my gosh this bag is gorgeous. Love the bag! 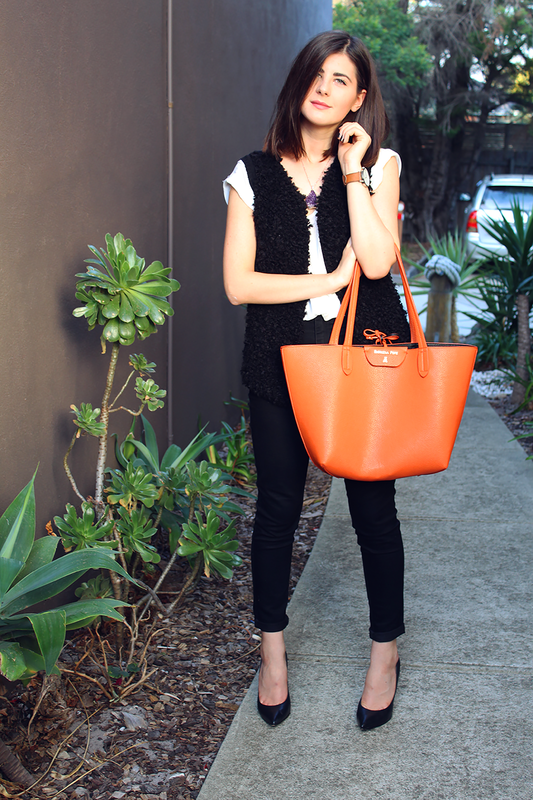 I love a big bag, as I pretty much always have my laptop with me- and I love knowing I have everything I need ;) Looks great with your outfit too! Lovely outfit, the bag really makes it perfect! Still love it ! Enjoy your day ! I love love your bag! I usually wouldn't pick such a bright bag either, but it got me! I'm currently trying to talk myself into wearing these to work tomorrow.... they're comfortable, but can I wear them for 9 hours? That is the question.. Thanks Bash! 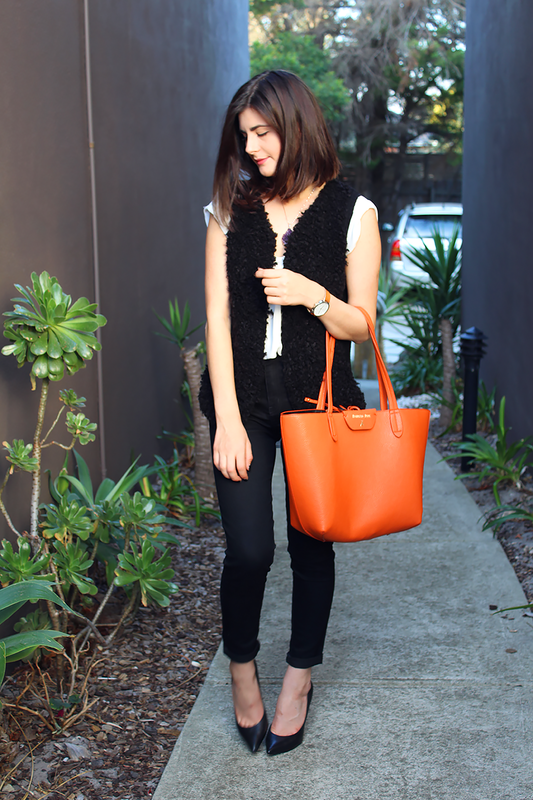 I feel like there's no better way to wear bright statements than with black and/or white! It's good to just know you have that option though, right?! Haha. That's actually amazing - I was searching for a similar pair all throughout Summer but now it's too cold for them! Such a great dupe though! ME TOO! Literally, all I want to wear in Winter is some shag sort of item. I remember one Winter I was so cold I scrambled to my wardrobe in the middle of the night and slept with one of them on. Laptops are a pain but big bags make life so much easier don't they? The higher the heel, the cuter - amiright? Helenaaaaaaa, this is perfect haha! I'm just still so amazed at it being reversible tbh. Thank-you for taking the time out to stop by and comment! I do read every single message, even if I don't reply individually - just know that I appreciate it.